First impressions are lasting. This means the tone you set for your course on the first day of class (FDOC) will stick with your students all semester long. Make this impression a positive one by engaging your students from Day 1! This site offers FDOC materials and resources that will help you kick off your class the right way and get your students excited about Connect®. 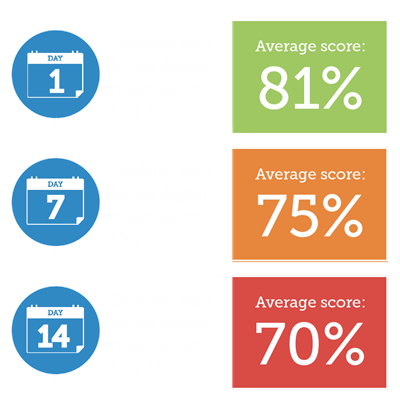 The numbers show that the earlier students register, the better they perform, so make sure they sign up on the first day to access reading, studying tools, and assignments for your course. Your students will thank you for it! View instructor tips, syllabus best practices, and more to help you be on top of your game on the first day of class. Get a class presentation deck, request a custom deck, and view more resources that will help you give a knock out presentation about Connect to your students. Get training and technical support to help you maximize your Connect experience. Share videos, the College Smarter student hub, and more with your students to get them excited about using Connect. Learn about how students can maximize their learning power for a very low cost with loose-leaf textbooks. Aliquam vel nunc nisl. Aliquam dapibus odio est. Mauris eleifend pharetra semper. Praesent dignissim lorem nec quam scelerisque tincidunt. Nam convallis ligula magna, non fermentum elit maximus ac. Mauris viverra nunc eu libero molestie egestas. * Based on Connect assignment data from 2.5 million students taking Connect courses in 2015. Failure assumes score of 60% or below on Connect assignments.